One of our newest FRAGRANT multi-floral miniatures ! A particular favorite for its delightful melon fragrance and floriferousness, its non-fading yellow flowers are kissed centrally with a radiating blush, further enhanced by its red lip. Its multi-floral habit comes from the pod parent, Phal. Tying Shin Christmas Gift, which is half Phalaenopsis equestris. 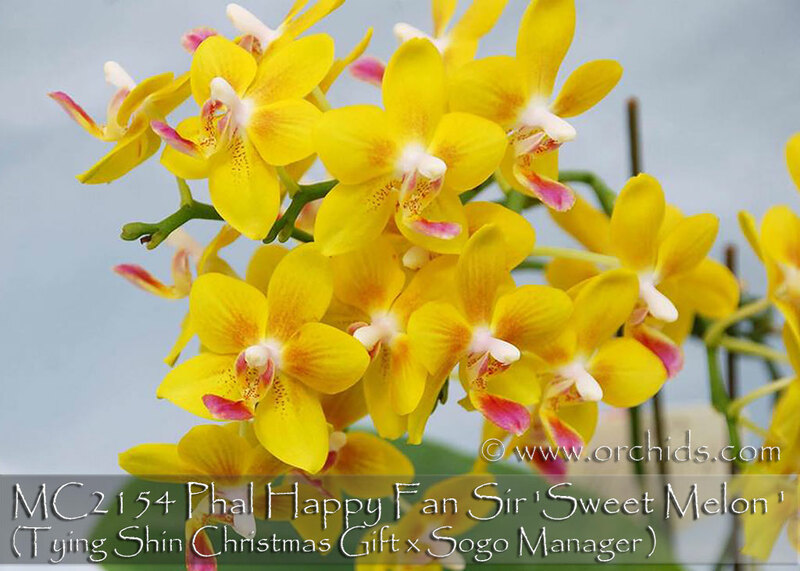 And its long-lasting flowers are heavily influenced by its waxy novelty pollen parent in addition to the novelty parent in Tying Shin Christmas Gift. A great bouquet of sunshine to brighten any day and Highly Recommended ! Sweet Melon , note : compact grower .